Bordeaux 2009. Last week Jan van Roekel and I visited Bordeaux, running from the one château to the other to taste the young 2009 vintage. After the many signs of an unparalleled vintage our expectations were... high. And yes, it was a joy to discover Bordeaux 2009. At the same time it was good to taste all these wines, because quality varied. We have tasted some breathtaking 2009s, but also some lesser gods. And even some unpleasant wines. I cannot point out a winning bank or sub-region: in every part of Bordeaux we encountered beauties as well as less special examples of the new vintage. What did I look for? Not just joy. As most readers will know all these wines are too young to be drunk, and also too young to be fully judged. But it is definitely possible to say something about these wines, as long as you take into account that they shouldn't in the first place be pleasing you. So again, what did I look for? Things like... does a wine display healthy (ripe) fruit or is there perhaps a lack of fruit? What is the quality of the tannins and how does the overall structure of the wine show? Does the wine come across lively and energetic, does it have freshness and good acidity? Am I tasting something pure, or something that seems more or less... assembled? What type of style is it, and do we look at something balanced or not? For me these are basic questions when tasting a primeur wine. Especially important for primeurs is the aspect of structure. When a wine lacks a proper structure it means the ageing potential will not be there. So it can happen that a primeur is quite pleasant, yet it will not be one of my recommendations. For ready-to-drink wines we do not have to look at primeurs. Château Smith-Haut-Lafitte (Pessac-Léognan) on the dark and rainy Wednesday 31 March 2010. Here is where we tasted most Pessacs. In this posting I will first focus on the wines from the Graves region. The Médocs, Saint-Emilions and Pomerols will be described later. What follows below is a short list of the red Pessacs that I liked the most. 1. Château Haut-Bailly 2009 (Pessac-Léognan). One of my favourite 2009s. A classic style wine with a very pure character, energetic fruit and lovely freshness. Plenty of matière and good ripe tannins. Precise, delicate and inviting (9/10). 2. Château Haut-Brion 2009 (Pessac-Léognan). Full-ripe, powerful and broad-shouldered. Attractive minerality. Lots of colour, very complete wine for the long term (but did I miss some refinement here?) (8,5/10). The 2nd wine Le Clarence de Haut-Brion 2009 is a lovely wine. Very purple, and compared to the 2nd wine of La Mission (see below) it just has a bit more of everything (colour, structure, intensity, acidity). A very complete wine and a beautiful 2nd wine. Just as its bigger brother, this wine needs some cellar time (8++/10). 3. Domaine de Chevalier 2009 (Pessac-Léognan). Chalky and lively fruit, good acidity, slender yet masculine structure (like Michelangelo's David). Modern classic (8,5/10). 4. Château La Mission Haut-Brion 2009 (Pessac-Léognan). Ripe fruit and a mineral touch. Style comparable to Haut-Brion but less round, say a little bit square. Quite prominent acidity also. Definitely for the long term (8++/10). Also liked the 2nd wine, La Chapelle de la Mission Haut-Brion 2009. Healthy hearty fruit, ripe, round and quite smooth. Chewable texture, good grip (8+/10). 5. Château Smith-Haut-Lafitte 2009 (Pessac-Léognan). Quite ripe. Round and powerful fruit. This is a rather seducing wine. There's also a nice chalky (fresh) touch. Style: towards modern (8+/10). 6. Château de Fieuzal 2009 (Pessac-Léognan). Svelte & vivid Pessac. Balanced, hearty texture, this is a good classic Bordeaux (8/10). 7. Château Couhins 2009 (Pessac-Léognan). Sweetish perfume. This wine has very attractive fruit. Chalky. Substantial structure, good stuff (8/10). 8. Château Le Thil 2009 (Pessac-Léognan). Wet stones... stony fruit. Pleasant freshness. Surprising wine for the medium-long term (8-/10). 9. Château Bouscaut 2009 (Pessac-Léognan). A modern Pessac, ripe and round, and with a good grip. This is an attractive wine for the medium-long term (8-/10). 10. Château Brown 2009 (Pessac-Léognan). Fresh, quite tight and pure. Very nice Bordeaux for the medium-long term (7,5/10). 11. Château Rahoul 2009 (Pessac-Léognan). Pleasant discovery but my tasting note is too limited to be very useful. Nevertheless this wine needs to be mentioned here (7,5/10). 12. Château Rouillac 2009 (Pessac-Léognan). Another discovery. New domain, wine made by Jean-Christophe Barron with Eric Boissenot. For the medium long term. Balanced wine with good structure yet supple mouth-feel. Lovely juice actually (7,5/10). Other reds that I rated 7,5 out of 10: Carmes Haut-Brion, La Louvière, Latour-Martillac, Olivier, Malartic-Lagravière, Pape-Clément and Picque-Caillou. From the white Pessacs that I tasted I picked out the following: Haut-Brion, La Mission Haut-Brion, Latour-Martillac, Couhins, Chevalier, Brown, Carbonnieux, Fonréaud and Fieuzal. 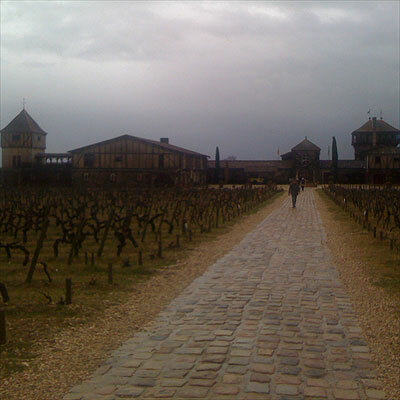 In the next postings I will look at the primeurs from the Médoc, and from Saint-Emilion and Pomerol. To be continued. We are planning to go to bourdeaux too. Thanks for sharing this. You gave me idea for our itinerary. Just a short question: Were you tasting the Chateau Couhins from the French Agrarian Institute INRA or the one from the Lurton group, so Couhins-Lurton. Just curious, as we have been drinking the INRA wine regularly in the past. Hi David, just curious what you thought about the white Ch. Pape Clement---I liked Chevalier the best for the whites, but Pape Clement also scored well for me. Hi Lindsay, I think the white Pape Clément is a good wine, rich and broad, but personally I prefer a bit more tension, acidity... For the reds, the Haut-Bailly was indeed outstanding. What a great wine!